What colours does Quebracho extract produce? How do I use Quebracho extract as a mordant? How do I use Quebracho extract as a dye on cotton? How much cotton does the Quebracho extract dye? 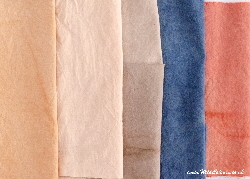 From left to right: quebracho as a dye (rose brown); quebracho as a mordant (pale rose brown); quebracho with iron (beige and taupe); quebracho with indigo (grey blue) and quebracho with madder (muted red). Quebracho (Schinopsis spp) is a tree with very hard wood that grows in the Gran Chaco region of Argentina and Paraguay. The word quebracho means axe breaker and it comes from the Spanish word ‘quebrar’ (to break) and ‘hacha’ (axe). The dye comes from the hardwood and it is rich in tannin. Quebracho can be used both as a mordant and as a dye for cotton and other plant fibres. Quebracho is also an important source of tannin for the leather industry. 2) What colours does Quebracho extract produce? Quebracho is a great dye to modify colours on cotton. On its own it produces brown rose, salmon or brownish peach, but the colours may vary. 3) How do I use Quebracho extract as a mordant? You can use it instead of gallnut extract or tannic acid as the source of tannin when following one of the cotton mordant recipes. Use 15 to 20 grams of quebracho extract per 100 grams of scoured cotton followed by a second bath with 7 to 10 grams of aluminium acetate. If you are using quebracho as a mordant, it is important to use quebracho before the aluminium acetate in order to achieve darker and brighter colours. Bear in mind that quebracho will add a brown undertone to your fabric. Using quebracho as a mordant will give you pale rose brown, the addition of iron will make it beige. If you want to over dye with indigo it is better to dye with indigo first, then mordant with acetate, followed by dyeing with quebracho; this will give darker and more sombre grey blues. 4) How do I use Quebracho extract as a dye on cotton? Scour the cotton fabric and mordant it with aluminium acetate (see Scouring cotton and Mordanting with aluminium acetate for details). Make a paste with 30 grams of quebracho extract and a small amount of warm water. Fill a saucepan with water and add quebracho extract paste. Add the pre-wetted mordanted fibre. Bring the dye bath to a gentle simmer and then keep at that temperature for 45 to 60 minutes, stirring gently from time to time. Leave overnight to cool. This produces rose brown; the addition of iron will make your fabric taupe; over dyeing with madder with give you muted reds. For over dyeing with indigo see above. 5) How much cotton does Quebracho extract dye? 20 to 30 grams of quebracho extract will dye 100 gram of cotton fabric light to medium rose brown or salmon. We suggest you experiment, as dye colours will vary with the type of fibre, the mordant and the quality of water. 6) What is Quebracho extract? Our Quebracho extract is shipped as a dark brown (nearly black) crystalline powder that is very stable and of high colour fastness. It is produced using processes that respect the environment and comply with organic textile certifications.